Males up to 7 in., females smaller. 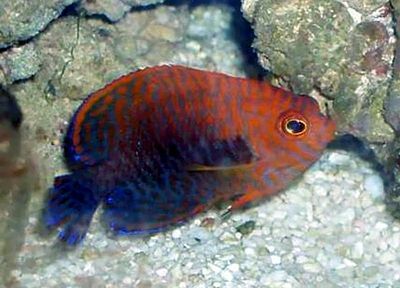 Except for Wrasses and some Triggerfish which may be a problem, other fish will react well. Minimum size tank for a female is 93 gal., for a male, 120 gal., for a pair at least 132 gal.. Best kept singly or in a male/female pairing. Found widespread from east of the Indian Ocean and Western Pacific to Fiji and Tonga.